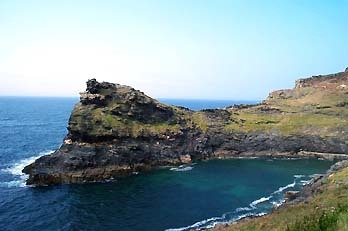 Boscastle derives its name from the castle built by the Bottreaux family, Normans who settled here in 1080. The castle was allowed to fall into ruins by 1478 and today no evidence of the castle exists above ground. 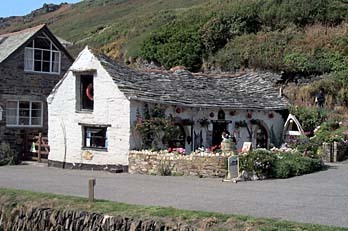 The town of Boscastle itself is built on the steep hillside above the harbour with the National Trust owning the narrow harbour and valley. 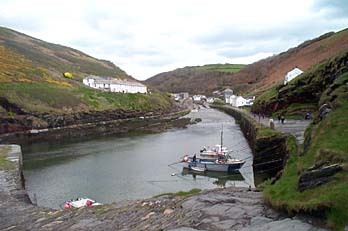 The Valency River runs through the valley and harbour. There are two piers; the outer pier was rebuilt in 1962 after a drifting mine in 1941 damaged it. The inner pier was rebuilt at the orders of Sir Richard Grenville in 1584 following two earlier piers. A 'blow hole' can be seen one hour each side of low tide in the outer harbour with waves rushing through a natural tunnel expelling spray across the harbour. The harbour has always been extremely difficult to navigate. Boats were towed in by rowed boats or by teams of horses onshore. 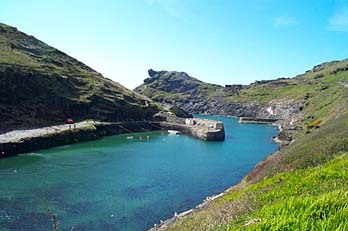 During the 19th century, with no local railway until 1893, all heavy goods in and out of the surrounding area went through Boscastle. It was then a bustling port with hundreds of sailings per year and even as late as 1920, 90 ton boats regularly visited with cargoes of coal, manure and iron. In 1849 a Mr. Fuggard already responding to the growth of tourism prepared paths and seating. The village received both national and international attention in 2004 when it was hit by a devastating flood on Monday 16th August. A torrent of water ten feet high surged through the village, when more than 6cm (2ins) of rain fell in two hours. There was a large number of tourists visiting the picturesque resort at the time. Hundreds of people were evacuated with people being rescued from roofs, trees, and vehicles in one of the biggest rescues ever seen in Cornwall. At one point there were seven helicopters rescuing people in the village. The lower part of the village was badly damaged and at the time of writing (January 2005) repair work is still being carried out.